Last year, Meagan and Brandon Holt’s daughter Maddie, who suffers from a rare and debilitating disease called Zellweger Syndrome, was given only a short time to live, and her family was forced to do what no family can ever imagine – put a 2-year-old in Hospice care. For months, the family administered several prescriptions that were intended to help Maddie. However, none of them seemed to work and, in fact, had a negative impact on her health. After months of watching Maddie’s health deteriorate, doctors had no more options, and her parents were preparing to say goodbye. 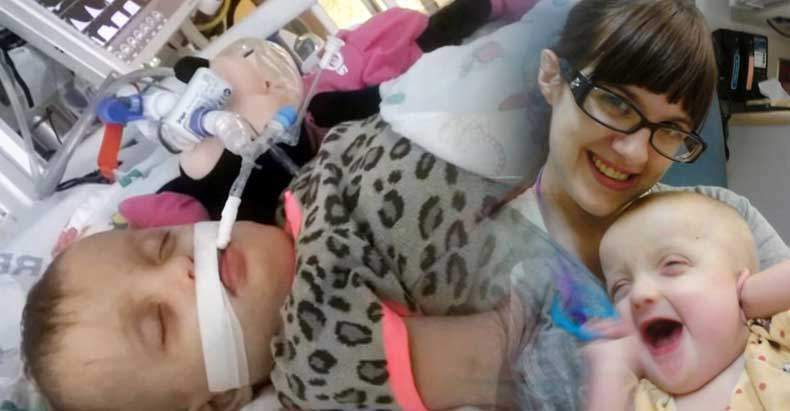 Maddie was going to spend her last days alive on life support in a hospital bed. “Without cannabis, she would be a vegetable, or worse, dead,” explained Meagan Tuesday, to the House Commerce and Gaming Committee. But all this hope would quickly be brought to an end thanks to a law that makes it illegal for growers to share cannabis with families like Meagan and Maddie who need this powerful medicine. But, Meagan, Brandon, and Maddie are fighters and Meagan has been pushing for legislative action, HB 2629, to reverse this ridiculous law. During the Committee hearing on Tuesday, Meagan took to the podium to deliver a moving speech. “This Bill is needed, so families like ours, who are in a situation no one should be in, can legally accept donations of a very expensive medication. If it weren’t for the generosity of the members of the cannabis community, we would not have been able to treat her. This Bill would allow me to be legally given life-sustaining medicine for my child. It would allow home growing of cannabis, which, in turn, could be processed and given to the patients that need it the most. I do not see anything wrong with sharing quality medicine. Being able to grow and share a plant seems reasonable. Please approve House Bill 2629, so me and my child are no longer criminals. The most important thing out of all of this that I want the legislators and really the government as whole, to realize is that this is more than just being allowed to share and grow cannabis. This is about the right to treat my daughter with a natural medicine. How can it be ok to want to over medicate our children? Why should a child who is on hospice suffering from a terminal disease, not be allowed to chose to use a healing plant that allows them to enjoy their final days? Cannabis allows my child to be herself. It allows her to enjoy the world while she is here. I can’t say for certain that cannabis will treat her Zellweger Syndrome. I still wake up to the reality that my child has already exceeded her life expectancy and every day could be our last. But what I do know is that with whole plant extract oil she is comfortable, coherent, and able to enjoy the little things, like a walk outside or play time with her sister. The federal government needs to stop criminalizing innocent people for a plant. I am doing what any good parent would do and doing what is best for my child’s quality of life. On Tuesday, the House Committee hosted an open forum and are deciding whether or not this Bill will move forward. The family is asking that everyone contact the committee members and voice your support of this Bill. Epilepsy affects one in 26 Americans during their lifetime, “with one-third having a form of the condition that resists treatment or effective management,” such as Maddie’s. The findings of this study add to the growing body of evidence that cannabidiol (CBD), a non-psychoactive extract of cannabis, can provide the best option for intractable epilepsy. Even in spite of cannabis prohibition, politicians are starting to break the law to provide people with cannabis. Rep. Allen Peake, a Georgia lawmaker, admitted that he defies unjust cannabis prohibition by bringing medical cannabis into Georgia from states where it is legal, such as Colorado. He recently delivered medical cannabis to a mother whose son suffers from seizures. The times are changing, and those who continue to throw people in cages or kill them for possessing a plant are being exposed for the vile tyrants they are.